Ashlyamfu (Ашлямфу) or sometime called Ashlyan Fu is the national dish of the Uyghur and Dungan people. They are the indigenous people of Eastern Turkestan, which is now the state of Xinjiang, China. This is the place where my parents were born Northwest China, before it became a communist country in 1949. I share a bit more of my family history in my Funchoza recipe, which is also an Uyghur dish, and is commonly eaten in Central Russia. The Uyghur are an indigenous people with a muslim faith, whilst the Dungan are of Chinese origin, living in the same historical region, who also are muslims. The Dungans also found their way across to Western Russia, Kyrgyzstan, and Kazakhstan in the 1800’s, and have evolved as a separate culture to the Chinese (referring to themselves as Hui people). The Dungan people speak a dialect similar to Mandarin Chinese, but the Uyghur people speak a Turkic dialect. They all share a similar food culture, which makes part of the foods that I grew up eating. Ashlyamfu seems to be made in several different ways, but is always served cold, can be served warm, but definitely not hot. In Soviet times, it’s claim to fame was that it was the national dish of Kyrgyzstan, specifically made famous by the city of Karakol, which is where many Dungan settled. There are several versions of this dish that all look kind of different. 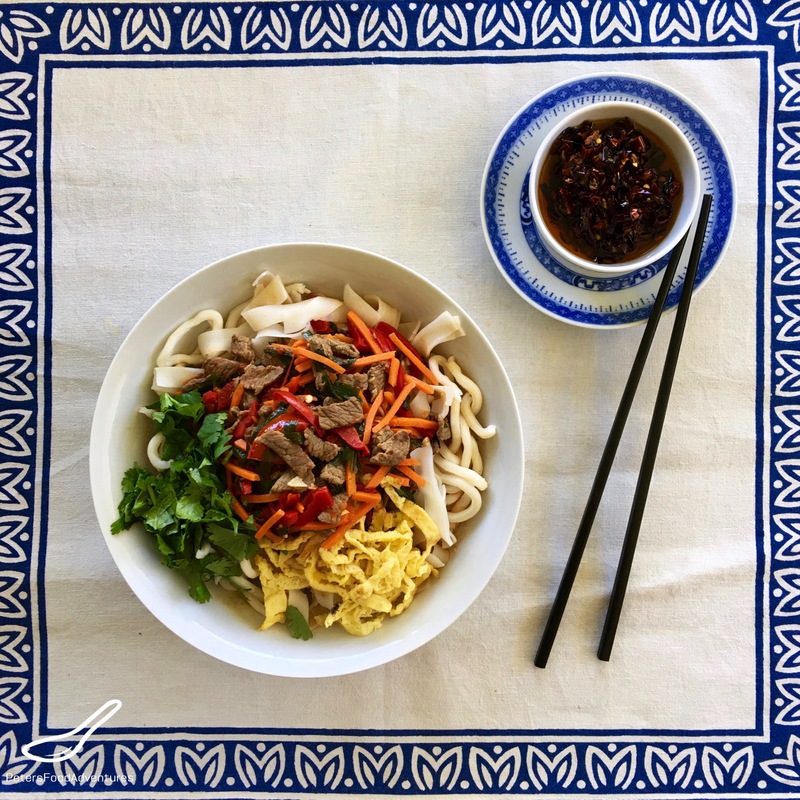 It can be made with Lagman Handpulled Noodles, or made with only Rice Noodles, and another version made with a sauce almost like a Noodle Soup. I love adding colourful vegetables like red peppers, garlic chives and cilantro. Traditionally, you cook your own starch, allow it cool in a large mass, then cut into thick strips. Thank goodness we can buy ready made Rice Noodles, which speeds up the process. The home made starch is really bright white, adding a nice contrast to the dish. Rice noodles look bland in comparison. It’s a lot of work to make Lagman Handpulled Noodles, which is why they are sometimes omitted, but the noodles taste amazing. We are all time poor, but I absolutley refuse to use dried Spagetti or Linguine Noodles in place of Lagman Noodles. Ashlyamfu can be made as a vegetarian dish, but I like to add thinly fried sliced beef or chicken strips. In lieu of making Lagman Noodles, I prefer making Ashlyamfu only with wide Rice Noodles. I find it lighter to eat and not as heavy of a meal compared to the Lagman version. For this recipe, I’ve made and photographed Ashlyamfu made with beef with Lagman Noodles and Rice Noodles together. Ashlyamfu is usually served with Lazadzhan or Laza Sauce, which is an Uyghur Chili Garlic Sauce. There are many ways to make Ashlyamfu Salad, using different ingredients, enough to keep everyone happy. Bon Appetit! Приятного аппетита! Cook the noodles in a pot of boiling water for 5-7 minutes until ready. Drain and allow to cool. Set aside. Heat 1 tablespoon of oil in a large frying pan and fry the thinly sliced meat, 1 clove garlic and chilli peppers until it's browned and cooked (8-10 minutes). There will be a point where the juices from the meat are released and will evaporate in the frying process. When the juices evaporate, add the 1/2 teaspoon salt or to taste. Add the carrots, peppers, garlic chives, and tomatoes to the meat in the frying pan. Stir fry together for about a 2 minutes, then add 1/4 cup of water and simmer for about 5 minutes. Add 2 cloves of minced garlic, mix together and remove from heat and allow to cool. In a frying pan, add 1 beaten egg and fry thinly like an omellete or like a crepe. Remove from heat. Repeat with 2nd egg. Allow to cool and cut into thin strips. Cut in quarters, roll it up like a cigar and slice thinly. In a bowl, mix all the meat mixture, sliced eggs, and noodles together. Add black pepper, 4 tablespoons Chinese black vinegar and 2 tablespoons soy sauce. Adjust to taste. That’s look insanely good! Nice coocking! Thanks so much! It’s a lot of work, I like all the contrasts of colour and textures.???? Thanks Lynne! It’s good and a little bit different! ???? I like it with lots of vege! Udon noodles would work??? Yup, I think they would definitely work! ???? I like colour and veg, so I tend to make sure my food has lots of both! What a nice blog, came here looking for the Ashlyamfu that I am currently having in Kaji-Say on the shores of Issyk-kul, and I’ll definitely be back for other dishes! Keep up the good work, Peter! Thanks Christoph! There are many variations of these dishes, enjoy! ??? ?